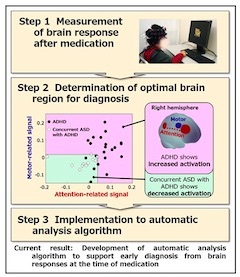 TOKYO, Feb, 11 2019 - (JCN Newswire) - Hitachi, Ltd., Jichi Medical University (JMU), International University of Health and Welfare (IUHW) and Chuo University (Chuo-U) have developed fundamental technology to support the early differential diagnosis of concurrent autism spectrum disorder (ASD) in patients with attention-deficit hyperactivity disorder (ADHD). The technology automatically analyzes the presence or absence of concurrent ASD when an ADHD patient takes their medication for the first time, by using optical topography to measure brain response. The condition can be predicted with a confirmed accuracy of about 82%. Conventionally, differential diagnosis requires follow-up observations spanning several months. This technique demonstrates the possibility of achieving a diagnosis in about 2 hours. Hitachi, JMU, IUHW and Chuo-U will continue to develop this technology through clinical research, with the aim of realizing a society that supports the healthy development of patients with neurodevelopmental disorders. Long term ADHD and ASD in children are thought to lead to refusal to attend school, hikikomori (reclusion from society), depression and other conditions. Differential diagnosis to reveal the presence or absence of symptoms for both illnesses is necessary, as it has been reported that the numbers of patients displaying characteristics of both ADHD and ASD are not small. Further, as determining treatment methods and therapy is a time-consuming process that increases the burden on patients and their families, reducing the time to accurate diagnosis was desired. In March 2018, research led by JMU discovered that it was possible to visualize the presence or not of concurrent ASD by measuring the brain activity patterns of ADHD patients who have no prior history of taking related medication, before and after taking the medication. Based on this finding, an algorithm was developed to automatically analyze whether or not the ADHD patient is concurrently afflicted with ASD. 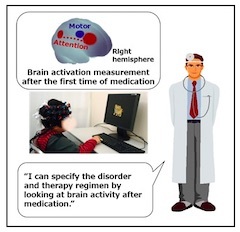 1.5 hours after the administration of the sustained release agent methylphenidate hydrochloride, optical topography signals of brain response from 32 ADHD patients with no prior history of taking related medication (11 with concurrent ASD and 21 without concurrent ASD), were measured for 10 minutes while the patients performed a simple cognitive task that involved pressing a button only when specific pictures were displayed on a PC monitor. Machine learning was applied to the signals measured in Step 1 and the diagnostic results obtained after several months. The results indicated that using the activation signals from the attention-function-related region (middle frontal gyrus-angular gyrus) and the motor-function-related region (precentral gyrus) were optimal for correctly distinguishing the presence or absence of concurrent ASD. Further, the most accurate classification was obtained by two-dimensionally plotting the quantities of activity signals in the above two related regions and setting appropriate thresholds with ROC curve, respectively. The automatic analysis algorithm was developed by integrating the algorithm for signals from the optimal brain measurement regions found in this development, and the noise reduction algorithm previously published. To evaluate the effectiveness of this technology, cross validation method was used to verify the accuracy in predicting the actual diagnostic result obtained several months later. The evaluation yielded an accuracy of about 82%, indicating that the technology may be a practical candidate as a differential diagnostic support tool for early diagnosis. It is expected that by adding these objective biomarkers, the diagnosis period that begins with doctors issuing questionnaires to families and lasts several months will be dramatically shortened, and consequently, doctors will be able to decide on treatment/therapy at an early stage and provide families with advice on how to care for the patients. Hitachi, JMU, IUHW and Chuo-U will continue to develop this technology through clinical research, with the aim of realizing a society that supports the healthy development of patients with neurodevelopmental disorders. A part of these results will be published in the Frontier in Human Neuroscience on 8 February 2019. "Recently, it has been found that the number of children with characteristics of both ADHD and ASD is not few. In other words, it has become necessary to not only distinguish ADHD and ASD from one another, but also determine whether patients are afflicted by both diseases. Determining such has been difficult for doctors who are not well-versed in the clinical practice of neurodevelopmental disorders. This technology is a breakthrough from the viewpoints of assistance in diagnosis through the objective displaying of data that serves as a reference for this difficult judgment, as well as its contribution to helping patients receive appropriate treatment. "The significance of the development of technologies for the diagnosis of neurodevelopmental disorder is significant because the diagnosis is largely dependent on the experience of the doctor and the basic idea of this technology that examines differences in brain responses on medications is ingenious. I think that its application to other psychiatric disorders can also be expected in the future. I hope that the research will progress further and become available in the clinical setting." "Since analyzing complex signals of optical topography requires expert knowledge and experience, automatic analysis technology that supports general physicians is important for clinical application. Development of the technology using the brain's response to medicine for diagnostic support can also be expected for other diseases and psychotropic drugs. "As research progresses, there is a possibility that it will become a mean for selecting the optimal therapeutic agent and behavioral therapy for each individual patient. In the era of our super-aging society, brain and mental diseases, from neurodevelopmental disorders to depression and dementia, are extremely significant social issues. Since the burden of such technology on patients is minimal, social implementation should be accelerated through the promotion of large-scale research." Hitachi is cooperating with the Japan Science and Technology Agency (JST) Research Institute of Science and Technology for Society (RISTEX) Research Program for "Implementation of Support System for Children with Attention-Deficit Hyperactivity Disorder by Functional Near-Infrared Spectroscopy Diagnostic Method," using the automation technology developed to support diagnosis using brain reaction. Autism Spectrum Disorder. A generic term for a developmental disorder exhibiting various degrees of characteristics associated with autism. Attention-deficit hyperactivity disorder. https://www.psychiatry.org/patients-families/adhd/what-is-adhd A common mental disorder affecting children, although it is also found in adults. Characteristics include inattention, hyperactivity and acting impulsively. Optical Topography: A non-invasive medical and scientific instrument that examines brain activity using near infrared light to measure and visualize the pattern of hemodynamic changes in the cerebral cortex at the brain surface. Medical examination using Optical Topography was approved by the Japanese National Health Insurance for the psychiatric field to support the differential diagnosis of depression as well as for use in the neurosurgical field. ADHD with concurrent ASD was added to the fifth edition of the Diagnostic and Statistical Manual of Mental Disorders (DSM-5), compiled by the American Psychiatric Association and released in 2013. Medication for ADHD which is gradually released in the body. Middle frontal gyrus - angular gyrus: A region of the cerebral cortex involved in attention function. Precentral gyrus: A region of the cerebral cortex involved in motor function. Receiver Operating Characteristic curve. The curve showing the relationship between true positive rate and false positive rate to obtain the optimum value for judgement. S. Sutoko et al., Adaptive algorithm utilizing acceptance rate for eliminating noisy epochs in block-design functional near-infrared spectroscopy data: Application to study in attention deficit/hyperactivity disorder children, Neurophotonics, 5(4), 045001 (2018). Cross validation: A method of verifying the accuracy of analytical techniques by randomly selecting a certain number of data as the training data and using the remaining data as test data. Currently, it is essential to improve and ensure the quality of medical care for the well-being of residents living in remote areas. This is the primary purpose of education at Jichi Medical University. In order to meet the demands of modern society, we must educate medical professionals to be dedicated and competent. As a result, in 1972 Jichi Medical University, and its school of medicine, was established to educate and train general practitioners. As of March 2018, 4,252 students have graduated from Jichi Medical University and are now making great contributions to community medicine. Jichi Medical University's education is based on three philosophies, seven principles and four goals to foster well-rounded general practitioners who practice community medicine. https://www.jichi.ac.jp/english/. International University of Health and Welfare (IUHW) was founded in 1995 in Otawara City, Tochigi Prefecture, as Japan's first comprehensive university specializing in health and welfare, aspiring to foster professionals in the fields of health and welfare and improve their status. We follow the university's founding principle, which aims to "Build a society for mutual respect and support," and operates 22 departments in nine schools at five campuses, where approximately 7,800 students study, including IUHW graduate students. To date a cumulative total of more than 21,000 of our graduates are working in the fields of health and welfare. In April 2017, a global School of Medicine was established in Narita City. In the School of Medicine, we provide new forms of education in medicine that put "Team Care Medicine" into action and nurture students to become international medical professionals capable of applying their skills anywhere in the world. Furthermore, we are implementing a variety of unprecedented measures, including the provision of lectures in English for the majority of courses and setting tuition fees at the lowest level among all private medical universities nationwide. In terms of teaching staff, we have selected faculty members from Japan and overseas, befitting the global School of Medicine. https://narita.iuhw.ac.jp/igakubu/en/. Since its inception in 1885, Chuo University has stayed true to its traditional philosophy of "Fostering the Ability to Apply Knowledge to Practice" by pursuing its mission to contribute to society as well as to nurture students who will go on to work for the betterment of society and pioneer its future. In 2015, Chuo University released Chuo Vision 2025, a ten-year development plan that includes the establishment of multiple new faculties, the upgrading of campuses, continued promotion of global initiatives, the promotion of sports, and the realization of its goal of becoming a comprehensive university. To learn more about Chuo University please visit our website at http://global.chuo-u.ac.jp/english/.